Here are some of my notes around boot options for ESXi. The post covers a lot of information especially around booting to SD or USB. What are the Options to install ESXi? What are the boot media options for ESXi Installs? Boot from a USB flash drive. Boot from a remote location using a remote management application. What are the acceptable targets to install/boot ESXi to and are there any dependencies? Note -ESXi does not support using local, internal SATA drives on the host server to create VMFS datastores that are shared across multiple ESXi hosts. Installing ESXi 5.0 requires a boot device that is a minimum of 1GB in size. When booting from a local disk or SAN/iSCSI LUN, a 5.2GB disk is required to allow for the creation of the VMFS volume and a 4GB scratch partition on the boot device. If a smaller disk or LUN is used, the installer will attempt to allocate a scratch region on a separate local disk. If a local disk cannot be found the scratch partition, /scratch, will be located on the ESXi host ramdisk, linked to /tmp/scratch. You can reconfigure /scratch to use a separate disk or LUN. For best performance and memory optimization, VMware recommends that you do not leave /scratch on the ESXi host ramdisk. 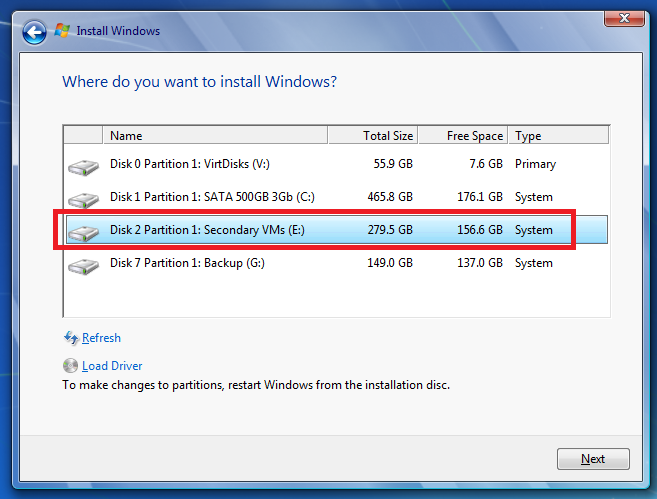 To reconfigure /scratch, see Set the Scratch Partition from the vSphere Client. Due to the I/O sensitivity of USB and SD devices the installer does not create a scratch partition on these devices. As such, there is no tangible benefit to using large USB/SD devices as ESXi uses only the first 1GB. When installing on USB or SD devices, the installer attempts to allocate a scratch region on an available local disk or datastore. If no local disk or datastore is found, /scratch is placed on the ramdisk. You should reconfigure /scratch to use a persistent datastore following the installation. 10 Great things to know about Booting ESXi from USB – http://blogs.vmware.com/esxi/2011/09/booting-esxi-off-usbsd.html <<< This is worth a read should clear up a LOT of questions…. How do we update a USB Boot Key? It would follow the same procedure as any install or upgrades, to the infrastructure it acts all the same. Can an ESXi Host access USB devices ie. Can an External USB Hard Disk be connected directly to the ESXi Host for copying of data? However the technology that supports USB device pass-through from an ESX/ESXi host to a virtual machine does not support simultaneous USB device connections from USB pass-through and from the service console. This means the host is in either Pass Through (to the VM) or service console mode. This entry was posted in ESX, ESXi, Test Lab, vmware. Today I tested Xsigo redundancy capabilities within the ESXi test environment. So far I have built up an environment with 4 x ESXi 4.1 hosts, each with a Single VM, and 2 Xsigo VP780’s. Each VM is pretty much idle for this test, however tomorrow I plan to introduce some heavier IP and NFS traffic and re-run the tests below. I used a Laptop and the ESXi console in tech support mode to capture the results. Keep in mind this deployment is a SINGLE site scenario. This means both Xsigo are considered at the same site and each ESXi host is connected to the A & B Xsigo. Note: This test procedure is simply the pattern I used to test my environment. I’m not stating this is the right way to test an environment but simply the way it was done. I don’t recommend you use this pattern to test your systems or use it for validation. These are simply my notes, for my personal records, and nothing more. XNA, XNB are Xsigo Network on Xsigo Device A or B and are meant for IP Network Traffic. XSA, XSB are Xsigo Storage or NFS on Xsigo Device A or B and are meant for NFS Data Traffic. Xsigo A sent a message to Xsigo support stating the I/O Module had an issue. Xsigo support contacted me and mailed out the replacement module. The affected module controls the IP network traffic (VM, Management, vMotion). Usually, an I/O Module going out is bad news. However, this is a POC (Proof of Concept) so I used this “blip” to our advantage and captured the test results. The I/O Module took about 4 minutes to come online. This test will simulate fibre connectivity going down for the IP network traffic. I will simulate the outage by disconnecting the fibre connection from Xsigo A, measure/record the results, return the environment to normal, and then repeat for Xsigo B. All active IP traffic for ESXi (including VM’s) might see a quick drop if it’s traffic is flowing through the affected adapter. This test will simulate fibre connectivity going down for the NFS network. Measure results via Ping, vCenter Server, and check for any VM GUI hesitation. All active NFS traffic for ESXi (including VM’s) might see a quick drop if it’s traffic is flowing through the affected adapter. Test 4 – Remove Infiniband cables from the ESXi HBA. During this test, I will remove all the Infiniband cables (4 of them) from the ESXi HBA. I will disconnect the Infiniband connection to Xsigo A first, measure/record the results, return the environment to normal, and then repeat for Xsigo B. ALL active traffic (IP or NFS) for ESXi (including VM’s) will continue to pass through the redundant XNB or XSB accordingly. All active traffic (IP or NFS) for ESXi (including VM’s) might see a quick drop if it’s traffic is flowing through the affected adapter. During this test, I will remove all the power cords from Xsigo A.
I will disconnect the power cords from Xsigo A first, measure/record the results, return the environment to normal, and then repeat for Xsigo B. It took about 10 Mins for the Xsigo come up and online from the point I pulled the power cords to the point ESXi reported the vnics were online.. Under very low load the Xsigo it performed as expected with ESXi. So far the redundancy testing is going well. Tomorrow I plan to place a pretty hefty load on the Xsigo and IOMega to see how they will perform under the same conditions. I’m looking forward to seeing if the Xsigo can perform just as well under load. How do you know if someone has rebooted and watched an Xsigo boot? This very cool logo comes up on the bootup screen! Now that’s Old School and very cool! This entry was posted in ESX, Test Lab, Xsigo.